These are real questions asked over the telephone in June 2012 to 1000 Americans. I’ll answer the question and then give the results of the survey. 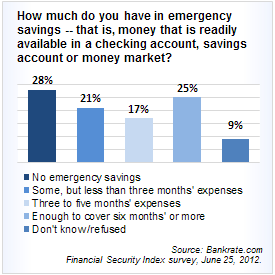 How much do you have in emergency savings (checking, savings, money market)? For us we’d be in 3-5 months range, but if we add in our allocated savings account the answer would be 6+ months. 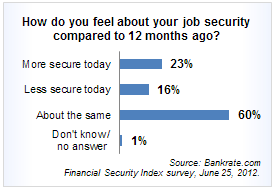 How do you feel about your job security compared to 12 months ago? I’m a robot and don’t have feelings. I’d have to answer more secure. Since 12 months I quit my steady paycheck day job and have found that I can make it as an entrepreneur. 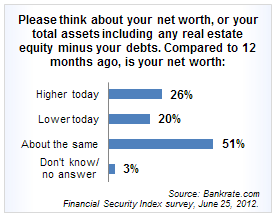 How do you feel about the amount of debt you have compared to 12 months ago? We had no debt 12 months ago and none today so #3 same for us. Our total net worth is lower due to pulling money out of savings for a few months. Our overall financial situation is probably worse today than 12 months ago as I build my business(es), but we are much happier and have the freedom to do what we love. How did your answers stack up to the survey? Overall, I feel slightly better now than I did a year ago. My net worth is up, my home value is up (small) and I feel optimistic. My job security is based on tenure (teacher). Home value is up? Wow! Is this based off taxes or comps in area? My answers are 4, 3, 3, 1, 1. I’m pretty fortunate though so I don’t expect a lot of people to be in the same boat as me. I also graduated into the recession and got extremely lucky with my first job. Lance, I bet it was more than luck that got your job. Have you written about that yet? Yes, definitely was more than luck but I try to be modest 🙂 I will have to add that to the list of things to write about! 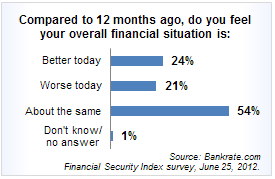 Interesting and largely positive survey. I’m impressed by the amount of people who think they’re better overall and who have a reserve in the bank. Maybe things are looking up more than I thought? I’d like to hope so too.